This post was first published in July, 2010. We are heading away for a few days, in search of warmer pastures and I thought I would take the opportunity to share this simple, travel-handy Peekaboo Game which I quickly whipped up to help keep Immy busy whilst we are travelling. I don’t know about you but I am always keeping bits and pieces which might come in handy one day, like the large, clear plastic bags which blankets and quilts usually come packaged in. And it just so happens, that that particular thick, clear plastic was perfect for this project. 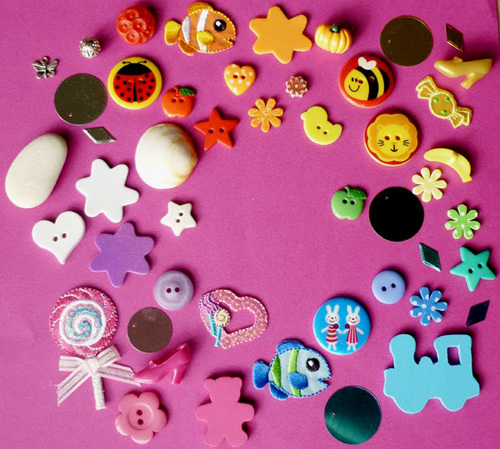 Our treasures include novelty buttons and beads, fabric patches, painted wooden shapes, foam shapes, large sequins, a rock, shell and a small shoe or two. Vary your treasures according to the age of your child, the smaller treasures are the trickiest to find (in fact, adult friends have struggled to find that tiny silver butterfly you can see in the top left). 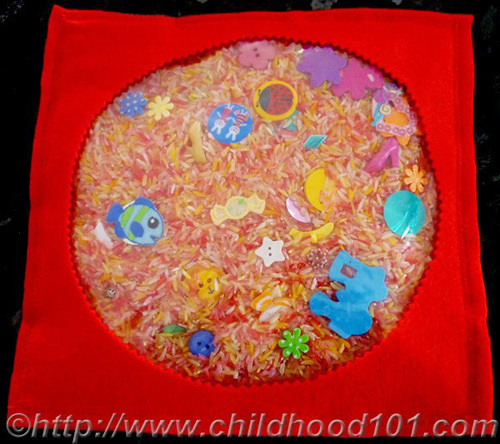 Then I cut two squares of felt, 1/2cm larger than the plastic pocket and I cut a large viewing circle from one of these pieces. I sandwiched the plastic pocket between the two felt pieces and using a couple of rounds of zig zag stitch around the outside, machined it all together. Be sure to photograph your treasures before you sew them into the bag. Print out the photo and laminate it and then have your child cross off each item as they find it with a whiteboard marker. If you are looking for more inspiration and practical ideas for travelling with kids as we head into school holidays and summer vacation time, be sure to check out my Road Tripping & Family Travel board on Pinterest. great idea. Never would have thought you could sew plastic. Did you use a special needle with your machine or just the standard one. These a great I have made some myself and everyone is a different set of fun. Have a great holiday. oo brilliant.. I was going to make an ispy bottle but I haven't found one with a big enough opening. I do however have some of those bags your talking about! I saw something similar that was commercially made. They were bags for each letter and the objects inside started with the letter that was featured. So the b bag might have a small boat, a tiny banana, etc. I looked them up and they were over one hundred dollars a set. I can't wait to use this idea to create my own!!! Yeah!!! What a great idea! 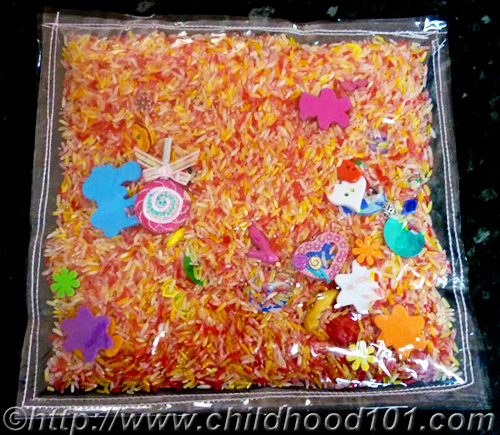 I something like this once in a plastic bottle with sand and picture erasers. On the outside of the bottle I taped a list of things to find. I like your method better though, because nothing can escape. I'm constantly worried that the glue will crack and the lid will come off the bottle. Nice work! WOW I love this idea Christie, well done yet again! What else could you use if you didn't have the plastic bag from blankets? Enjoy your well earned break. Could you use some clear vinyl/table cloth plastic? Also what needle and thread did you use? This is a great idea! You have so many great ideas I now have to find enough time to get them done. I'm soooo excited!!! Thanks! Good idea i'm going to visit my nieces my one year old niece would love this.